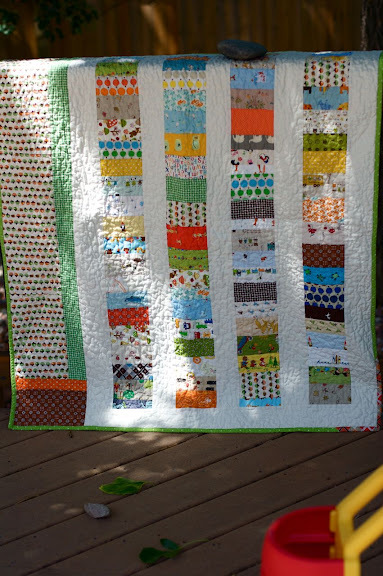 this is a custom made quilt, with a request for lots of mushrooms! my favorite part might just be the backing, originally i was going to put more mushrooms, but then i stumbled on this 3 little pigs print from sew deerly loved on etsy. i really, really like it. Oh dear, I was supposed to make my cousin's baby quilt from my stash but I just had to go buy some of that adorable backing fabric. So precious. Love the quilt! Love the panel of mushroom fabric on the left side...very cute! Love your sense of colours!!! I'm sure the recipient will be very pleased - lovely! This is so cute! I agree - the panel on the side is such a cute idea! I love it! This quilt is so cute. Wouldn't it also look adorable twin size for a little kids room? 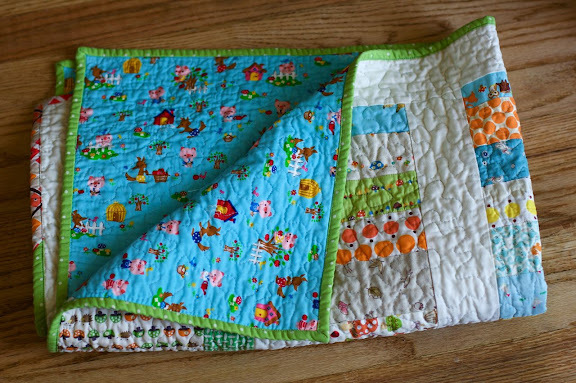 You're killin' me with all your adorable baby quilts!!! I love that they aren't teddy bears and cutsie...they're modern and so lovely! Oh gosh - the backing is darling! The entire quilt is wonderful, but I love the back too! That quilt is just so sweet and cute! I looks so cute and the backing is adorable. So so great!! Wonderful quilt. 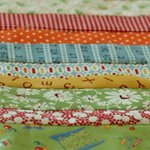 Lively and fun and amazing fabric choices! i really like how you've added the mushrooms and green on the side. ooooo, and the back is super cute! aww... such a sweet quilt! Love the mushroom strip on the side and the backing is precious! What a wonderful quilt! Baby's going to love it. Looks great, this is one lucky baby! Thanks for sharing! Sweetest quilt I've seen in a long long time. Just gorgeous! such fun colors! 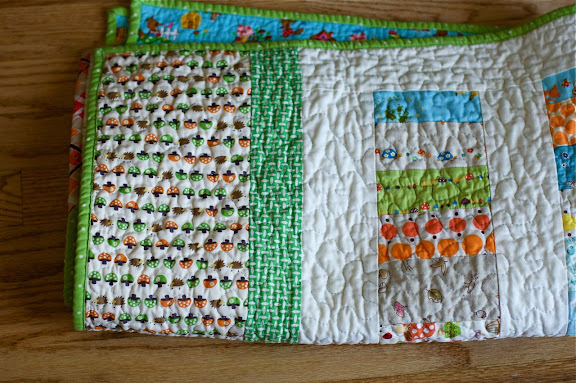 and that mushroom print looks way cuter on a quilt than i thought it would! awesome job! Oh, Nettie, I wish that quilt was heading to my house! very sweet! I love the colors. I love chinese coin quilts too. They are so fun and the fabric really is the star. I too love the backing. I purchased a cloth baby diaper made out of that fabric. Now I know where to find it-- thanks! All your quilts are amazing. I love how quilty they look. I have to start practicing free motion quilting. Or do you use a long arm?